Now, I bring to you part two of the “Iwata Asks (Business Trip Edition)”. 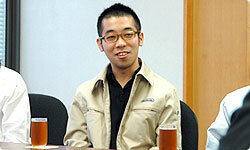 This time, I have asked five of our younger development staff to take part in the interview. Like our readers, I am also looking forward to what we’re going to hear from them. Now, let’s begin by asking you to introduce yourselves. I am Hayashida from EAD Tokyo. For this game, I was responsible for the overall stage design. My main job was to create the flow of the game, while listening to the other staff members’ opinions. My name is Shimizu, and I’m from EAD Tokyo. My main responsibility was to work on Mario’s movements and animation. Hi, I’m Aoyagi from EAD Tokyo. For this Mario game, I made the gravity system, and I was also responsible for the programming of the enemies and the bosses. Hello, I am Shirai of EAD Tokyo. My work was similar to that of Hayashida-san, in the sense that I was also responsible for the stage design, but I was more in charge of the details. I put all the stage designs together one piece at a time, and my job was to fine-tune them so that the overall design would be balanced. My name is Motokura, and I am also from EAD Tokyo. I worked on managing the character designs. Basically, I worked on anything that had to do with the characters, like the player characters, the bosses and the objects. Well, the first thing I would like to ask all of you is for how many of you was this the first Mario game that you were involved with? And the other four had worked on previous Mario games, like Super Mario Sunshine. Aoyagi-san, what was your impression working on a Mario game for the first time? 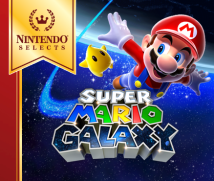 Nobody would question that Mario games are the flagship titles of Nintendo. But at first, the fact that I was actually involved in making a Mario game didn’t really sink in. I felt like “Me? Making a Mario game?” (laughs) So I tried to always think about what defined a Mario game. There is this tradition in the Zelda team where during development, the staff would discuss with each other continuously what the “Essence of Zelda” was. On the other hand, I haven’t really heard the staff in the Mario team talking to each other about the “Essence of Mario”. So as someone who had previous experience with Mario, Hayashida-san, what do you think defines the “Essence of Mario”? In the Zelda Volume of the original Iwata Asks interviews1, Miyamoto-san did say something like that. 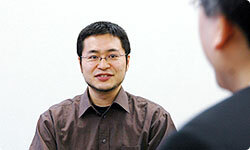 1 The Zelda Volume of the Iwata Asks Interviews is part of a series of interviews published on the Nintendo website. What constantly came up during my discussions with Koizumi-san, the director, was how it was important for a Mario game to feel good to the touch while you are playing the game. I believe the "Essence of Mario" is that a Mario game should always be a "new toy" - that it should feel both pleasant and responsive. I also think that Mario is a title that represents video games in general. In making a new Mario, it’s release is highly anticipated by our customers, so I felt that we had to keep the tradition of Mario games, yet at the same time, we had to bring in new ways to play in the game. Due to this, you feel pressure to resolve a whole variety of issues while working on a title like this. There are many traditions that you had to remain faithful to, while at the same time you had to bring in new ideas. It must have been difficult trying to find the perfect balance between the two. 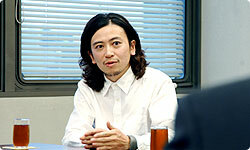 Shimizu-san, as the person involved with Mario’s movements, what do you think? I think you’re not able to talk about a Mario game without discussing jumping. You write all kinds of programs when making a game, but the most difficult of them all is when it has to do with Mario’s jumps. In this game, there were more than ten ways for Mario to jump, and it changes from one form to another depending on the way you control the game. So, I truly think the heart of this game lies in the jumping. Shirai-san, how about you? You were responsible for the stage design. Exactly! (laughs) I wanted the people who would be playing this game to experience that same urge to keep trying it over and over again. I felt this was a game where it was extremely important to find an ideal balance in its difficulty level, a balance that the players will find comfortable in the end. The player can work out what they need to do in order to clear the level, but they will have a rather difficult time trying to perform the actions needed. It will take them several attempts until they are able to clear it. So, the game is not so difficult that they want to give up, yet not too easy either. You are saying that the balance had to be fine-tuned. I think that is what the “Essence of Mario” is. You know what you need to be doing, but as you play, you happen to press a bit too hard with your thumb and make a mistake, but somehow you know that it’s really your fault, and not the game’s. Thinking that way, it makes you want to try it another time. I understand that feeling well! (laughs) Mario games somehow make the players think when things didn’t go as they wanted that they're the ones at fault, and not the people that made the game. Motokura-san, what do you think as the designer? Speaking from a designer’s point of view, I had been told by Miyamoto-san that a design “had to be functional”. Designers tend to start by designing how the characters look, but according to Miyamoto-san, if you do that you will “lose sight of its function”. In some Mario games, turtles that clearly look like they'll hurt you if you step on them appear in-game. Is that the kind of functional design you mean? Right, so while I worked on the designs, I was always considering things like putting spikes on enemies like that. That is the kind of thinking that could only come from Miyamoto-san, with his background in studying Industrial Design2 during his school years. You mean that the form must represent function. 2 Industrial Design is an applied art focusing on designing the function and external design of industrial products. I originally had this image inside my head of a character that I thought was "Mario". However, when I tried to draw Mario according to what I had in mind, it just didn't look right. I tried to combine characters that showed up in the previous games of the series but they didn’t look right, either. So I decided to start by learning the character's functions, closely paying attention to the new character concepts. It became much easier to draw when I tried it from that direction. Also, it may seem strange for me to say this as the person designing them, but there's a side to the enemy characters where they exist just to be defeated by Mario. These enemies must also be designed according to which stage they would appear in. No matter how well-designed an enemy character could be, they will look out of place if they do not go well with their surroundings. So by having the enemies placed in areas of the game that fits their design, they become more than ready to be defeated by Mario.